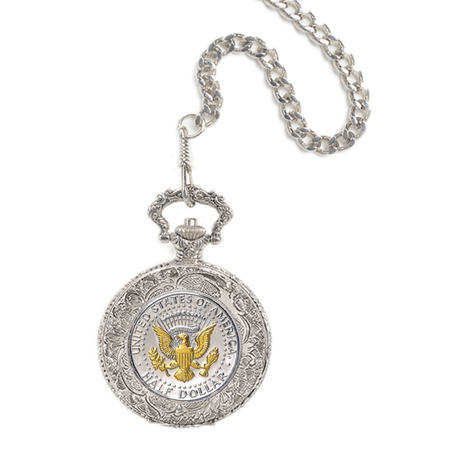 The Presidential Seal, the obverse side of the JFK half dollar is displayed on the front of an intricately carved pocket watch case. The Presidential Seal is selectively Gold-Layered adding a handsome richness to this classic timepiece. This watch has a sweep second hand, quartz precision, and a one year warranty. Attached to a fob chain it arrives with a Certificate of Authenticity. Allow 1-2 weeks for delivery. Item can only be shipped within the Continental US.